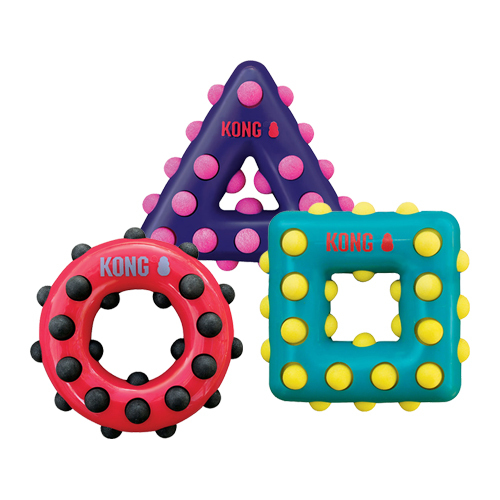 The KONG Dotz are cheerful toys made of plastic with soft rubber studs. This rubber contributes to cleaning the teeth and gums. These toys can also be used to play fetch. The combination of the material and shape of these studs bounces the Dotz in every possible direction. Available in three different forms: triangle, square and circle. The Dotz from KONG have a double effect. It is not only a fun toy for your dog, the Dotz also contribute to cleaning the dog's teeth and gums. Throw the toy away and watch your dog chase it. This toy is made of plastic with rubber studs. The combination of these studs and the shape bounces the Dotz in every possible direction. Triangle. Small: 10.5 x 11 cm. Large: 15 x 16 cm. Square. Small: 10 x 10 cm. Large: 15 x 15 cm. Circle. Small: 9 cm. Large: 16 cm. Have you used KONG Dotz before? Let us know what you think about this product.